With lead blogger Marian Wang, we're re-mixing today&apos;s accountability stories. We&apos;re also just starting this, so e-mail Marian your ideas. "In 2003, Buffett called these complex instruments &apos;financial weapons of mass destruction.&apos; ... Buffett wants his company's $63 billion derivatives portfolio to be essentially grandfathered in. To achieve this, he has lobbied Sen. Ben Nelson, the Nebraska Democrat to whom Berkshire and its employees have contributed $75,550 during his political career—more than any other company." 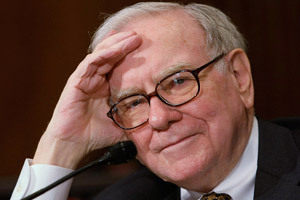 Everybody gives Warren Buffett a pass because he gave tens of billions to Bill Gates to channel to "charities" Warren knows will further the system of the elitists. It&apos;s pure image-making, not from the heart. Also, the article makes derivatives sound like a good thing; however, when the system came down, derivatives were the main-culprit device of the ultra-greedy in their global Ponzi scheme (suckers beware). The toxics are being hidden and the costs passed onto the lower classes. Buffett knows it too but won&apos;t do the right thing.